National Drug Law Enforcement Agency has reflected on its success in curbing the trafficking of hard substances in the South-eastern part of Nigeria. 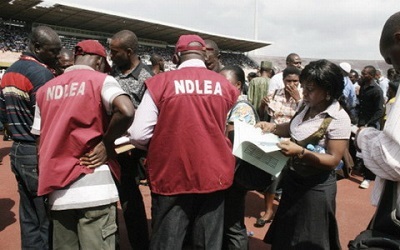 The Anambra State command of the National Drug Law Enforcement Agency on Tuesday said it had arrested no fewer than 1000 persons suspected to be dealing in illicit drugs from January to June this year. The state Commander of the agency, Mr. Sule Momodu, said this in Awka, the state capital during an event to mark the 2017 United Nations Day against illicit drug abuse and trafficking. He said, “10 of the suspects had been convicted during the period, while 150 cases were pending in the Federal High Court, Awka”. He said the agency had executed 100 raids in and around the state during the period under review. Momodu said the day celebration which was supposed to be celebrated on the 26th of June was shifted to July 4th due to the Sallah holidays. Momodu noted that parents should always listen to their children’s aspirations and needs so as to guide them appropriately. He maintained that the fight against illicit drugs required the efforts of governments at all levels, religious leaders and traditional rulers. A guest Lecturer and Assistant Director, Training of the agency, NDLEA National Headquarters, Mr Abdul Momodu identified bad parenting, poverty and poor opportunities for education as some of the factors that make children vulnerable to illicit drugs. Mr. Abdul Momodu who observed that illicit drug was the great enabler to organized crime, said parents should be closer to their children and wards to enable them to have strong bond with them.